My thoughts be bloody or nothing-worth! Across the street from Couch Place (alias Death Alley), a regular tour stop, is The Goodman Theatre. It’s an unlikely place to find a body, but tucked away in some guy’s desk is the skull of comedian Del Close, who left his skull to the theatre in his will so that next time they do Hamlet he can play Yorick. 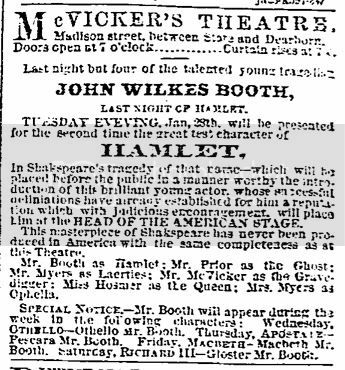 John Wilkes Booth was Chicago’s theatrical sensation of 1862, playing a three week stint at the (now demolished) McVicker’s in January followed by a two week stand in June. During these stands, he played at least half a dozen of the greatest Shakespeare characters, including Hamlet, Richard III, Romeo and Othello. Most people think that the real talent in the family was Booth’s brother, Edwin (who had a career that lasted for decades), but the Tribune called John Wilkes a genius. History books today rarely mention just how popular an actor he was. I can only imagine how weird it must have been for people who saw him plotting to kill the king as Hamlet, or plotting to kill half of England as Richard III, to remember those scenes in 1865! While in Chicago, Booth stayed at the Tremont House, a (now demolished) hotel on Dearborn and Lake that had been owned by Ira Couch, whose tomb still stands in Lincoln Park, the last remaining crypt of the old City Cemetery (and, yes, he’s thought to be in there – the mystery is who’s in there WITH him). Abraham Lincoln also stayed at the Tremont House whenever he was in Chicago; he gave a version of his “House Divided” speech from the balcony in 1858, and held a reception in the lobby after his election in 1860. After the Lincoln assassination, there were reports of Booth being sighted, alive, in McVicker’s theatre – one of many reports that the person killed in the barn was not really him. Twenty years later, his daughter, under the name Rita Booth, was said to be working as a dancer in a burlesque comedy in Chicago. Will Roosevelt’s Ghost Endorse a Candidate for 2008? Rising from the Suburbs….Belle Gunness!